Baltimore State’s Attorney Marilyn Mosby wants to block the release of the autopsy report and other “sensitive” documents in the upcoming trial of six police officers accused of Freddie Gray’s death in custody. Attorneys for the police officers oppose the “gag order,” saying that the move suggests the state is trying to hide something in the autopsy report. Furthermore, they point to the fact that Mosby herself made a big show of announcing the charges to the media. “It’s as if she wants to do everything to make sure our clients do not get a fair trial,” Bates added. Mosby charged Lieutenant Brian Rice, Sergeant White, and officers Caesar Goodson Jr, William Porter, Edward Nero, and Garrett Miller with crimes and misdemeanors ranging from misconduct to “depraved-heart murder” on May 1. The six police officers were involved in the arrest of Baltimore resident Freddie Gray, who died in mid-April from a fatal spinal injury he allegedly suffered inside a police van. Gray’s death prompted weeks of peaceful protests, boiling over into a riot on April 27, the day of his funeral. Maryland declared a state of emergency because of the unrest, and almost 3,000 National Guard troops were deployed in Baltimore. Mosby previously sought a “gag order” to prevent all parties from discussing the high-profile case in public, and has not released the autopsy report to the police, contrary to long-standing practice. The Baltimore Sun is among 19 news organizations challenging the gag order request. Bates says the new protective order would allow only the prosecutors and defense lawyers to access the documents, and could mean that all new filings making reference to the documents would have to be sealed. He said this would make it more restrictive than a gag order. 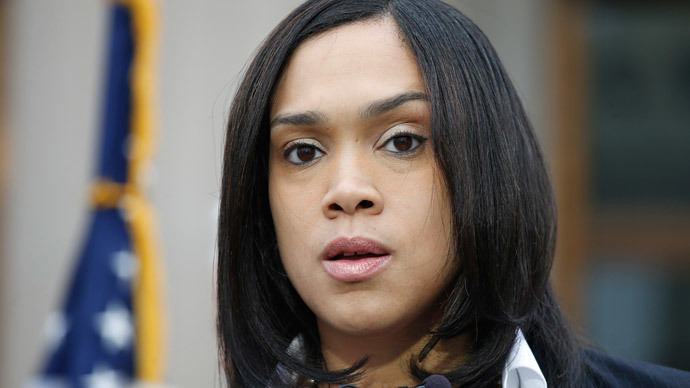 Following her announcement of the charges against six officers, Mosby became somewhat of a celebrity and attracted considerable media attention. Defense lawyers said they had “deep-seated concerns” about Mosby attending public events and doing magazine interviews, while asking for an extension to answer their motions in the case. “It’s very disconcerting that six [defense] lawyers were able to write these motions in two weeks, and the state’s attorney’s office has over 200 or some attorneys and they need an extension,” Bates said.